To write consistently for your book or your business, you need to have a plan. The idea that you’ll write whenever you can often leads to many days where no writing at all happens. And vague intentions to write, even on a particular day may not come to fruition. The best way to write consistently is to schedule a specific time and to include it on your calendar. Of course you need to set aside enough time to get any writing tasks and projects done but there’s even more to it than that. Not only do you need enough hours to get the job done, but it’s helpful to know your rhythm and style when working with time to do your writing. Let’s take a closer look. Get to know your own natural rhythm for when you do your best writing. If you think you know when that is (first thing in the morning, maybe in the evening after dinner), honor that time. Don’t work against it. Find ways to make this time your writing time. Put it on your calendar (in ink!) to keep it from competing with other activities and don’t trade that time at the first indication that something isn’t fitting in your week or day. If you’re not sure when your “best” time is, do a little experimenting. Try first thing in the morning. Try late at night. Mix in mid-afternoon or even a weekend time slot. We all are unique in our rhythms and what helps us to be more relaxed and in the flow. Be open to playing around with this until you settle on what feels like a good time. Recognize that being a morning person doesn’t necessarily translate into that being the best time for you to write. Also know that your natural rhythm for writing may change as your schedule, routines, and life, in general, changes. Be flexible. Once you’ve established what now seems to be your preferred writing time, decide how much time you need for a particular writing task. Sometimes life can get in the way. If other things have cut into your scheduled writing time, before you throw in the towel, consider getting a start on your writing piece. Yes, even if it is not the full time you had initially planned, you may still be able to accomplish some writing. During these moments when you don’t have enough time to complete your piece in its entirety, you still have some choices. You can start it now just to get a jump on it, even knowing you don’t have as much time as you had hoped. In this instance, sometimes you will surprise yourself and get a lot more done than you first thought possible. Or you may find it helpful to push yourself to get at least the beginning in motion and this may help your writing flow more when you come back to it later. Another option is to hold off altogether on writing now and plan when you will make time for it. Use the little time you have now to complete other tasks. Crossing other things off your to-do list may help you later on by clearing your mind from distractions to write. Get to know your own rhythm, strengths, and preferences for timing your writing and you are sure to get those words flowing.The real work in writing often comes before we begin. Have you determined your best time to write? How did you arrive at that time and do you honor it by scheduling it in? Want to learn more about Deb's work? Check out her free resources! 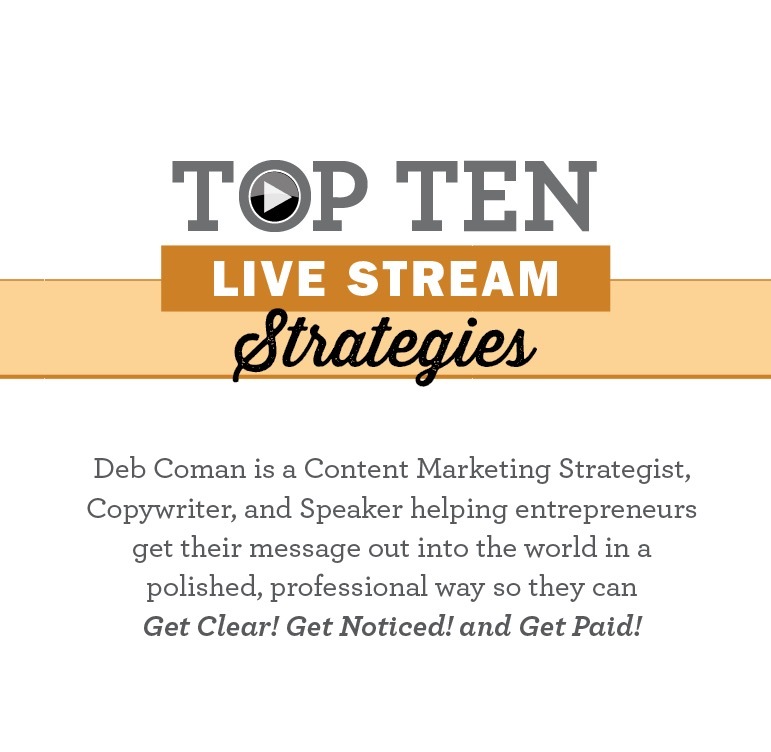 Deb Coman is a Content Marketing Strategist, Copywriter, and Speaker. As the founder of www.DebComan.com, she empowers writers and entrepreneurs to capture and convey their core purpose and message. Using her 7 Steps to Content Marketing Strategy That Converts program, their online (and offline) presence attracts readers, clients, and referral partners. Click here https://debcoman.com/resources for your free copy of 7 Steps to Content Marketing Strategy That Converts and other free resources.